I want to share my five favorite places to get the circular wheel of carbohydrate wonder that is the bagel. 1. Bagel Hole (400 7th Ave Brooklyn, NY 11215): Located in Park Slope Brooklyn, this little bagel shop is probably named after the hole in the bagel but also could be named after the size of the interior. What the space lacks in square footage it more than makes up for with the size of their bagels. These bagels are thicker than normal New York bagels, packed full of doughy goodness and loaded with flavor. Opened in 1985, the bagel makers here learned their craft from someone who has been making hand rolled bagels since the 1940s. 2. Ess-a-Bagel (359 1st Ave, New York, NY 10010): One of the oldest bagel institutions on the list, Ess-a-Bagel has two locations in the City, but I recommend checking out the original shop on 1st Avenue. Making hand-rolled bagels onsite since 1976, they have mastered the no frills approach to the perfect bagel. Don't ask for your bagel toasted as toasting a bagel is a sign of a "bad" (stale) bagel and the line here is normally to long to warrant the wait. 3. Murray's Bagels (500 Avenue of the Americas, New York, NY 10011): Part of the newer wave of bagel stores, Murray's has become a West Village staple since opening its doors in 1996. Making bagels that are the size of a small wheel and bursting with flavor, the options here are endless. If you are not sure what flavor to try, go for the everything bagel which is a traditional New Yorker's choice. 4. Kossar's Bialys (367 Grand St, New York, NY 10002): After 65 years in the bialys business, Kossar's started making bagels in 1998 and never looked back. Kossar's makes bagels in traditional New York style, which means they are huge with a doughy inside and a crispy outside. These pinnacles of the poppy seed are made fresh daily and housed in a no-frills location where you get up close and personal with pallets of baked goods and flour on the floor. 5. Zucker's (146 Chambers St New York, NY 10007): Don't let the more upscale décor of this establishment fool you, Zucker's takes pride in creating authentic NYC hand-rolled and kettle-boiled bagels. In addition to the traditional mix of cream cheese options, here you will find some of the best bagel deli sandwiches this side of the Hudson. Zucker's is most famous for their bagels and lox, which is a must get when visiting the Chambers Street location. While this is no means a definitive list of the best of the best, these are our current favorites. 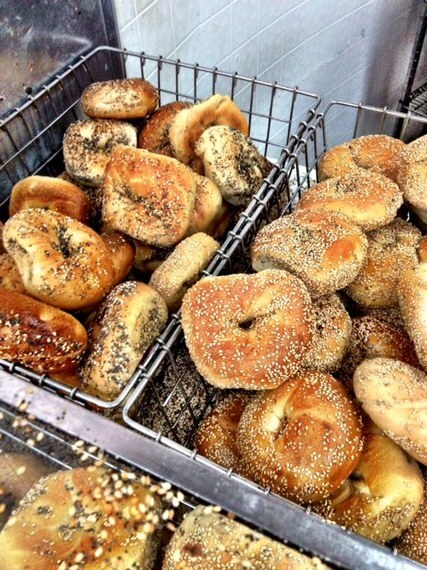 Now it's your turn to sound off, where is your favorite spot to get a true New York bagel?